More than a jewelry organizer, this Wall Jewelry Armoire is lighted and can be locked adding depth and interest to any room. This gorgeous front mirror with a quatrefoil frame design features your choice of available finish. This mirror opens to reveal soft lining, eight lined drawers, six ring rolls with a center divider, five double hanging hooks, a bottom shelf for easy to reach storage, and a jewelry pouch at the bottom. On the door of the mirror you'll find space to hold your earrings. 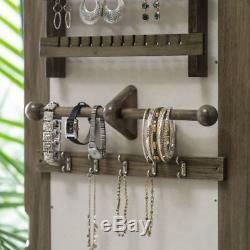 You can hang more necklaces and bracelets on the 10 double hanging hooks. Six LED lights on the interior turn on when you open the door, making it easy to find the pieces you're looking for. If you don't need the lights, simply turn them off with the manual on/off switch on the top interior. 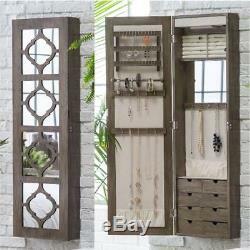 Lockable doors keep your items secure in whichever room you hang this Wall Jewelry Armoire. 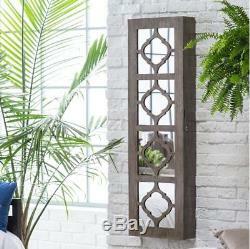 Front mirror with quatrefoil frame design. Ring storage: 6 rolls dimensions: 13.25W x 5.75H in. Interior mirror dimensions: 13.25W x 9H in. Is placed 10.25 in. Down from top of armoire. Hanging hook storage: 5 double hooks with 16.5-in. Hanging space and jewelry catching pouch. Shelf measures 13.25W x 3.5D in. Removable drawers: 2.75L x 6W x 2.4H in. 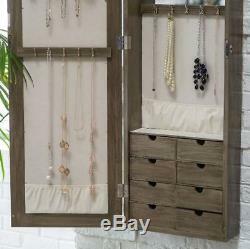 Earring storage: 3 rows with a total of 13 spaces dimensions: 10.25W x : 8.75H in. Bracelet bar: 11.25W in. Hanging hook storage: 5 double hooks with 16.25 in. Jewelry pouch on bottom of interior door to catch items that drop from hooks or serve as additional storage. Boxes or Military APO's. The item "Wall Jewelry Armoire With Mirror Large Mounted Organizer Locking Cabinet Light" is in sale since Sunday, October 7, 2018. 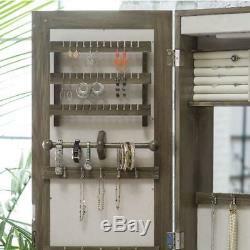 This item is in the category "Jewelry & Watches\Jewelry Boxes & Organizers\Jewelry Holders & Organizers\Multi-Purpose". 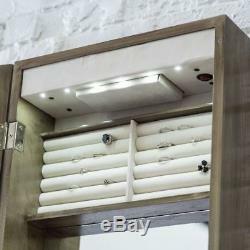 The seller is "mybargainzone2014" and is located in Brooklyn, New York.